2 Bdrm 1st flr Flat. Hall. Lounge/Dining kitch on open plan. 2 Bdrms. Bathrm (CT band - TBC). Parking. Price over £175,000 Entry by arr. Viewing contact solicitors. Below Home Report Valuation (EPC band - B). 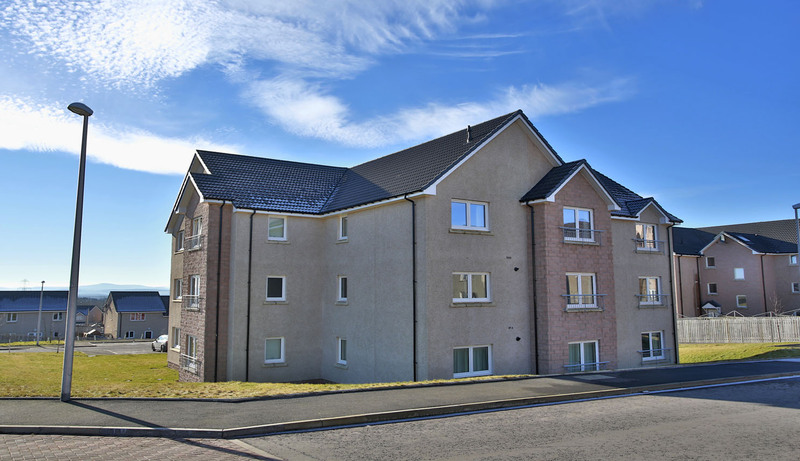 Located in a modern and executive development completed by Stewart Milne Homes, we are delighted to offer for sale this bright and spacious two bedroomed first floor flat which boasts an allocated parking space. The property is undoubtedly in ready-to-move into condition with neutral décor and modern finishings throughout. 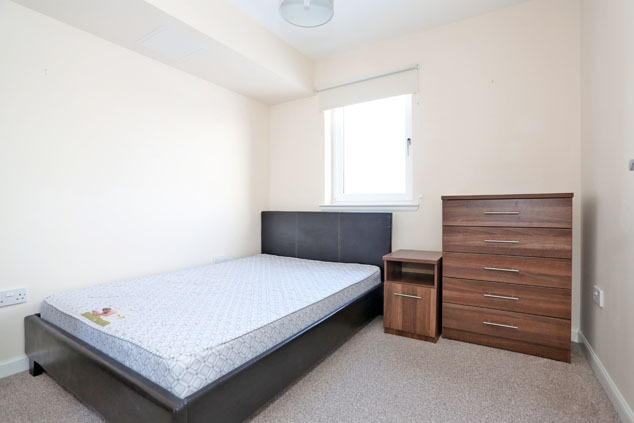 The apartment comprises a welcoming entrance hall which leads onto all the accommodation, bright and well proportioned lounge with dining area on open plan to a contemporary kitchen, two good sized double bedrooms each with built-in storage and a modern bathroom. Outside the grounds are very well maintained under a factoring contract and there is the luxury of an allocated parking bay. This truly is an excellent opportunity to purchase a stylish and generously sized executive apartment within a sought after development and therefore early viewing is genuinely recommended. Westhill is a popular and vibrant family town with an enviable range of community facilities including reputable schools, a shopping centre and health centre. 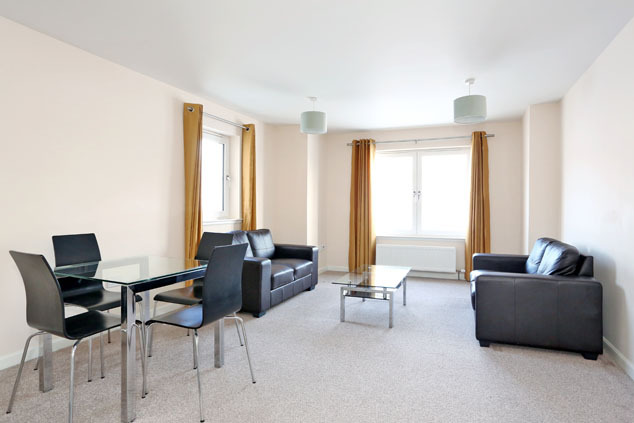 Enjoying excellent transport links to the city centre and surrounding towns. Communal Hall Entered via a security entry door, the communal areas are maintained under a factoring contract and are neat, tidy and well lit. A stairway leads to the first floor. Entrance Hall A timber white panelled door leads into this spacious and welcoming hallway which boasts neutral tones with co-ordinating carpeting. Storage is provided by a deep cupboard with light and it also houses the fuse box, meters and boiler. Smoke alarm. Security entry handset. Central heating control. Lounge/Dining/Kitchen 25’0” x 12’12” [7.63m x 3.95m] approx. This bright and wonderfully spacious room is flooded with natural light by dual aspect windows overlooking the front and side of the property. The lounge and dining area are finished with neutral décor and carpeting. 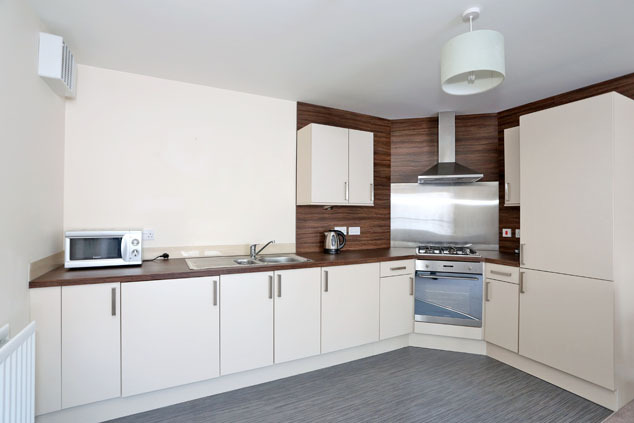 The modern and fully equipped kitchen is on open plan and is fitted with cream base and wall units which are edged with wood effect panelling and topped with butchers block effect work surface incorporating a 1.5 stainless steel sink with mixer tap and drainer. The integrated appliances include a gas hob with stainless steel chimney extractor above, oven with grill function, fridge, freezer and washing machine. Smoke alarm. Television point. Telephone point. Bedroom 1 13’1” x 8’8” [3.99m x 2.66m] approx. 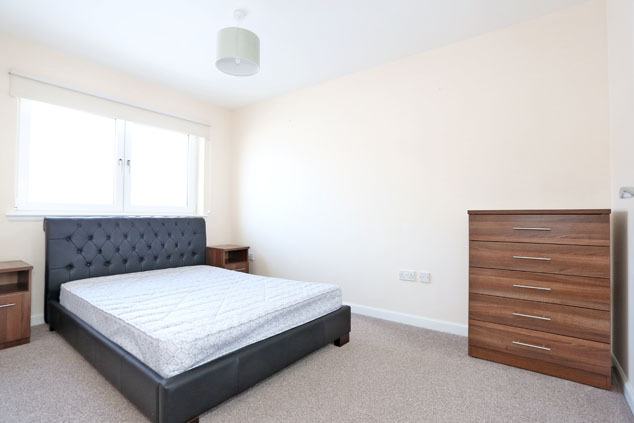 Overlooking the front is this naturally bright double room enjoying fresh neutral tones and carpeting. A built-in double wardrobe with mirrored sliding doors provides excellent storage and there is ample space for free standing furniture. Television point. Telephone point. Bedroom 2 9’5” x 8’11” [2.86m x 2.74m] approx. This good sized double is again to the front and enjoys lots of natural light to complement the fresh décor. A double wardrobe with mirrored doors provides storage and there is space for free standing furniture. Bathroom 8’8” x 6’6” [2.64m x 2.00m] approx. Centrally set this stylish bathroom comprises a three piece white suite which includes a w.c. and wash hand basin built into a dark wood effect storage unit and bath with mains pressure shower and glazed screen. 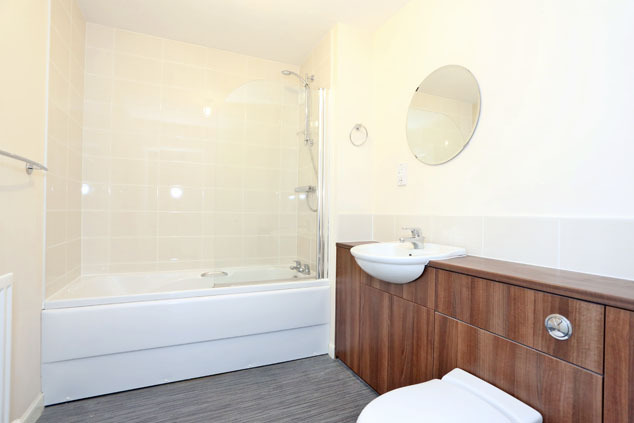 To complete the room there is extensive modem splashback tiling, vinyl flooring and wall mounted mirror. Shaver point. Extractor. Outside The grounds are very well tended with large areas of lawn and paved pathways. A large carpark has allocated spaces and a high fence conceals the communal bin area. Notes Gas central heating. Double glazing. EPC=B. The subjects are to be sold inclusive of all fitted floor coverings, light fittings, curtains and blinds along with the integrated appliances. Please note all furniture will be included in the sale.